Tonight one of our Javalina buddies stopped by to say hi. It’s illegal to feed them, but it’s hard to resist their pleading little beady eyes, dancing snout and permanent smile. 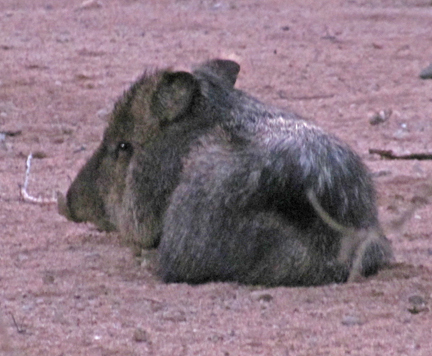 The Javalina are so ugly, they’re cute! This guy is a regular visitor. 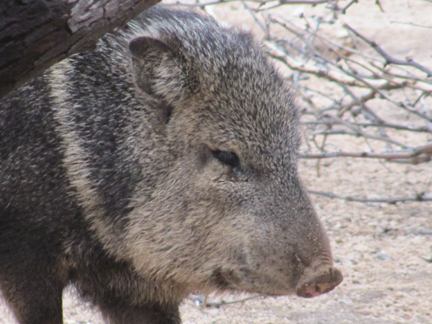 We call him Jairy- (The J is pronounced H, as in Javalina)…. On his frequent visits, Jairy usually finds time to take a quick nap! Sometimes we get the entire family. There’s about 5 in a group that come around fairly often. This guy is a loner. Maybe because the males separate from the group when it’s mating season…but honestly, I don’t know for sure. What I do know, is they stink! I mean really, really stink….like skunk! We love them anyway! However, on a sad and serious note, we believe that someone in our neighborhood is setting down traps to keep them away. We’ve noticed more than a couple that seem to have injured feet. We also had a bloody trail crossing our driveway in the front. We know that the Javalinas can be a pain in the neck. They’ve caused lots of damage in Todd’s Backyard, but we solved the problem by putting up an electric fence…not ideal, but effective! It’s doesn’t seem to have hurt their feelings what so ever! ← Tickled to be Prickled! great photos, Rondi. We didn’t see them yesterday, but we had company so weren’t paying attention. Were you able to see Things Ive Found In Pockets? Thanks Eileen! I did check out Things I”ve Found In Pockets…It’s great! See if she would mind me adding her as a link on my blog. I’m hoping to add links for all my talented friends….althought I’ve never met your niece (? ), I would love to include her! Another amazing entry Rondi….Have a drink for me….I’m working on Sunday;again:) Your posts brighten my day and inspire me to continue working on my yard. I know of a lovely gentle elderly lady that can name any stone. I believe she lives around Jerome and will have her look at your pics. I too found a huge stone that looks as if it may be turquoise…I have been wanting to have it identified. Weather it is truly turquoise or not doesn’t much matter to me…it is so lovely. Thanks for posting! You pics are great!! !